Newswire keeps subscribers up-to-date on critical issues impacting the practice of medicine in California. It publishes bi-weekly and is distributed to over 50,000 subscribers (including physicians, medical practice managers, hospital medical staffs and more). CPR keeps subscribers up-to-date on critical payor and health care industry changes impacting the business of a medical practice. It publishes monthly e-bulletin and is distributed to more than 1,500 subscribers, primarily consisting of practice managers and administrators. Each issue includes tips on reimbursement and contracting related issues along with information on the latest practice management news. With a strong, intuitive architecture, modern user experience, and dynamic messaging, the updated CMA website enhances the value of membership. Physicians visit the website on a regular basis to the go to resource for legislative, regulatory, legal, and economic issues, practice help and to learn about opportunities for leadership and professional development. CMA's website receives 300,000 visitor sessions, 200,000 visitors and 800,000 page views every year. CMA takes pride in offering members unique and beneficial benefits tailored to their specific practice setting or lifestyle. To learn more, please contact Matt Overton Director of Business Development: 916-551-2030. 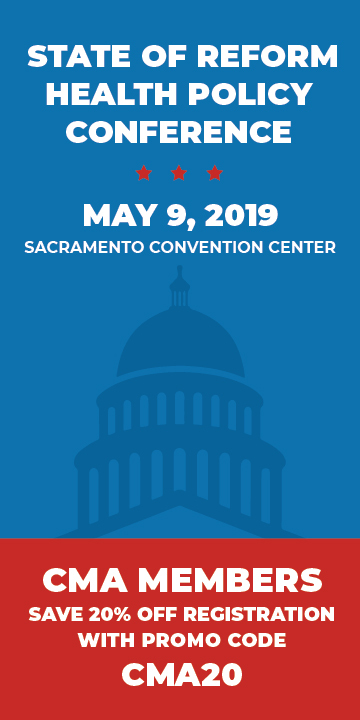 The Council provides a valuable forum for corporate leaders, CMA and Physicians for a Healthy California (PHC) to share innovative ideas and insights, explore collaborative opportunities, and collectively discuss common goals and challenges. Council membership is annual and provides exclusive opportunities for corporate leaders to showcase their companies’ commitments to California’s health care. Network with the leaders guiding California’s patient care. Visibility with more than 43,000 physician CMA members representing all modes of practice. Recognition as a corporate member throughout CMA and PHC publications, educational resources and hosted conferences. Collaborative opportunities to inform, develop and participate in statewide programs that address health issues and shape the future of medicine as well as smaller group sessions. From press releases to op-eds, explore the most pressing issues and opportunities facing California's physicians.